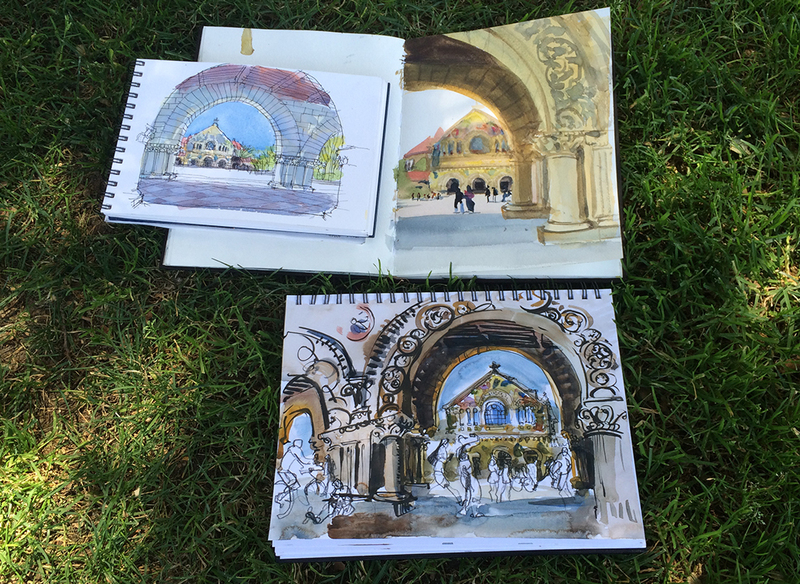 [By Gail Wong, Suhita Shirodkar and Laurie Wigham on the Stanford University Campus, Palo Alto, CA, USA] Urban Sketchers has created an international family of sketching friends. It is always a great opportunity to meet new people at the symposiums or to touch base with sketcher friends as one visits different parts of the world. 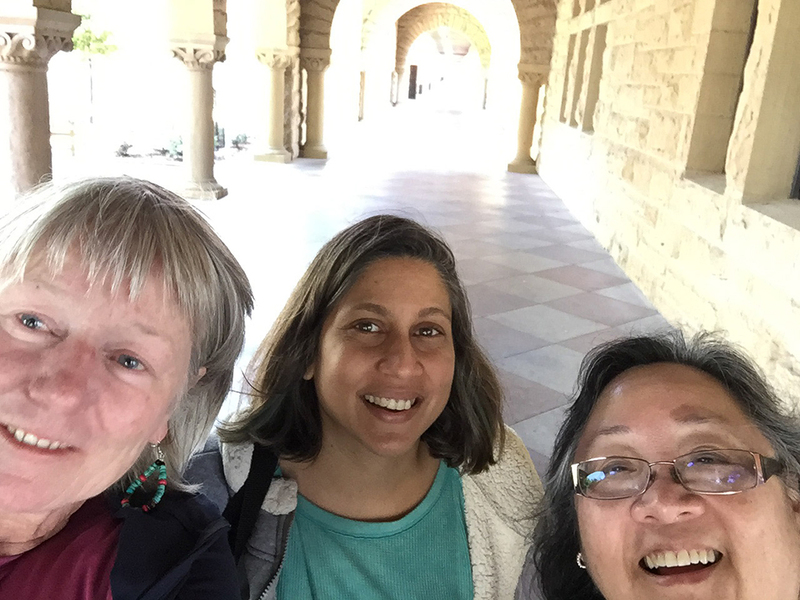 While visiting family in the Bay Area of northern California I touched base with sketchers Suhita Shirodkar and Laurie Wigham. Here is a look at what we did. 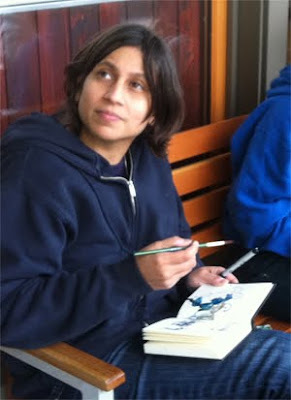 Last week I had a chance to sketch in California with sketcher friends Suhita Shirodkar and Laurie Wigham. We all met up at the Stanford University Campus and sketched the Memorial Church. Suhita from San Jose, Laurie from San Francisco and me coming across the Bay from Fremont, California. It was the highlight of my week to be able to sketch with them. 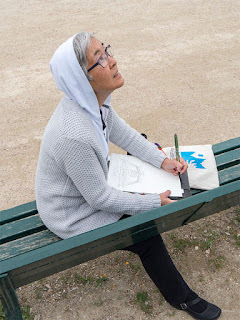 There is something we gain from sketching with other people, from being able to see and learn from other people’s work. 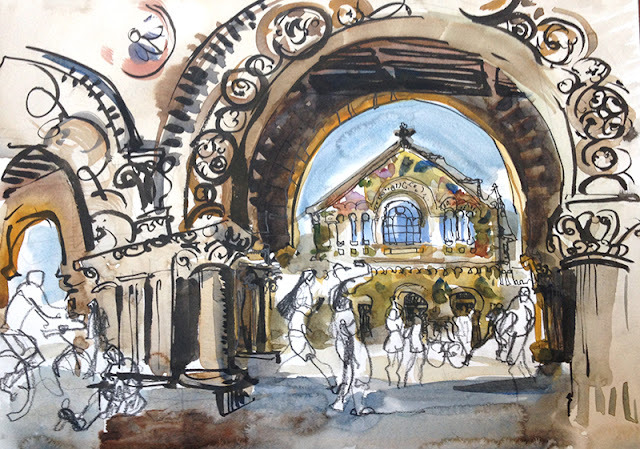 After seeing my sketch next to Suhita’s and Laurie’s, it really dawned on me how light the value of the arcade was which framed my view of the church.The blue sky seems to have the same value as the arcade and everything looked flat, there was no real sense of depth. 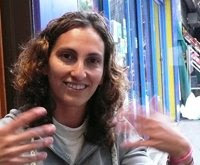 What was separating the shapes was not value as much as color. You can see my little sketch next to the larger ones done by Suhita and Laurie. 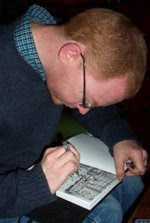 Increasing the contrast, as seen in the final version of the sketch enhanced the separation of space and made the sky and the church appear lighter and brighter. The other thing that impressed me was the fluidity of Suhita’s and Laurie’s watercolor sketches that day. I was sketching like an architect not like an artist. So my next sketch, which I did with Laurie, went for feeling over representational accuracy. I was inspired by my fellow sketchers on both sketches with out them knowing it! 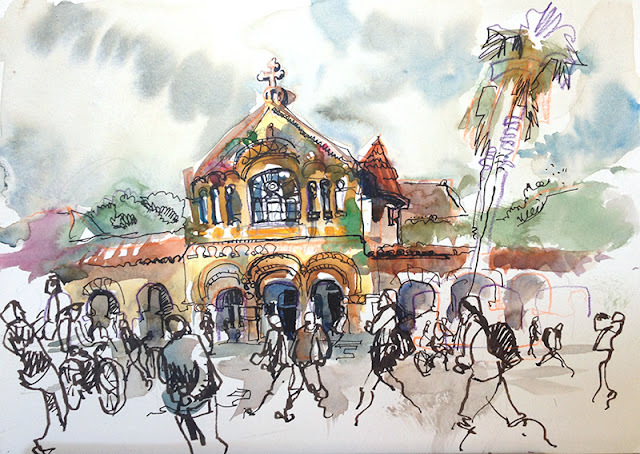 One of my favorite things about having a large urban sketching family is that when a sketcher visits town, we try to meet up and do what we love doing: sketch! 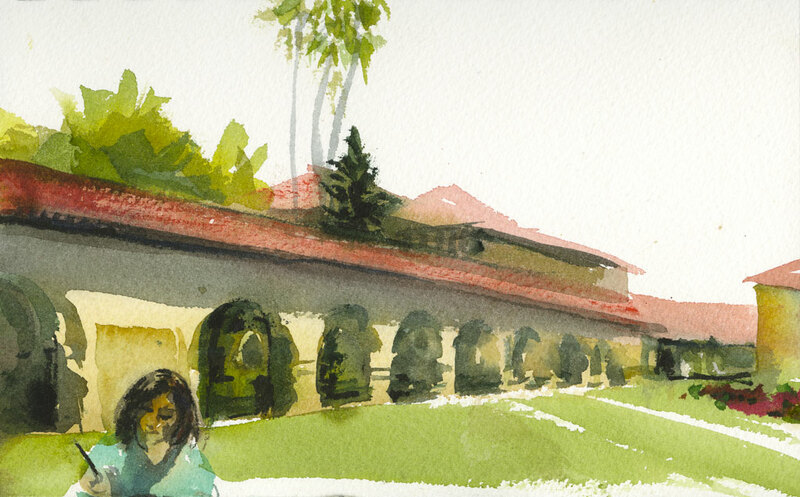 So when Gail visited from Seattle and Laurie said she’d drive down from San Francisco, we chose a location where you can never tire of sketching: the Stanford Campus, right by the really grand Memorial Church. 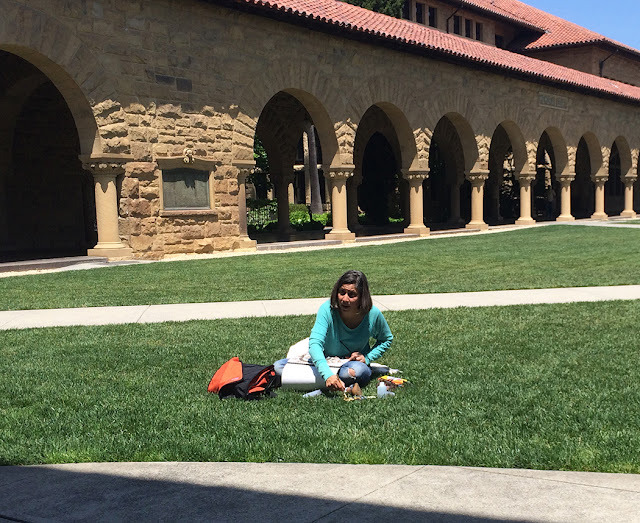 It was finals week (or close) and the always busy students looked more preoccupied than ever as they scurried across the huge courtyard without glancing up at the church. 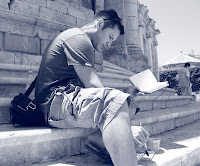 You can see from my sketches, that more than the superb church, it was those busy, busy people that totally fascinated me. Wish I’d had more time to stay and sketch longer… still, I’m glad for the quick little sketch meetup. As Gail said, you learn so much from just working alongside another sketcher. And it’s always lovely to see all the really different interpretations of the same subject. It takes a visitor from out of town to get me to look in my own backyard. I’ve lived in the Bay Area for 30 years and never explored the heart of the Stanford campus. 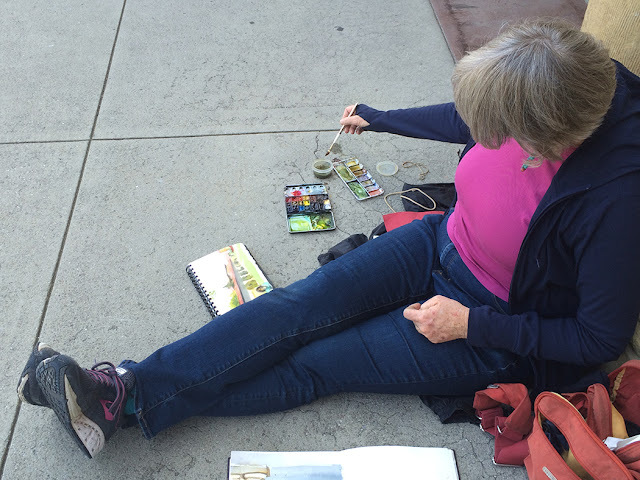 What better way to discover it than with other sketchers? We were all so overwhelmed by the complexity of the chapel that, without talking about it, we headed to the far end of the vast courtyard to sit down and sketch. Even so, my attempts to give an impression of the glittering mosaic mural on the chapel ended up dissolving into a blob. 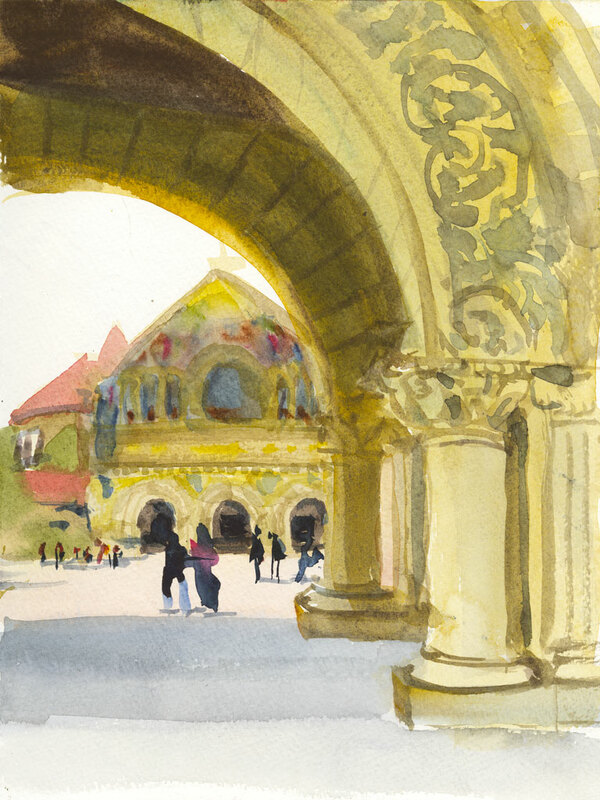 And trying to sketch the carved sandstone on the arch made me really appreciate John Singer Sargent’s light and graceful touch on his Italian stonework watercolors. Time to hunt down that book and figure out how he did it. After all that heavy stone I wanted to do something quick and simple, so I turned around and sketched Suhita. On the way back to our cars, Gail and I settled down on a bench in the Rodin sculpture garden to do a quick farewell sketch. 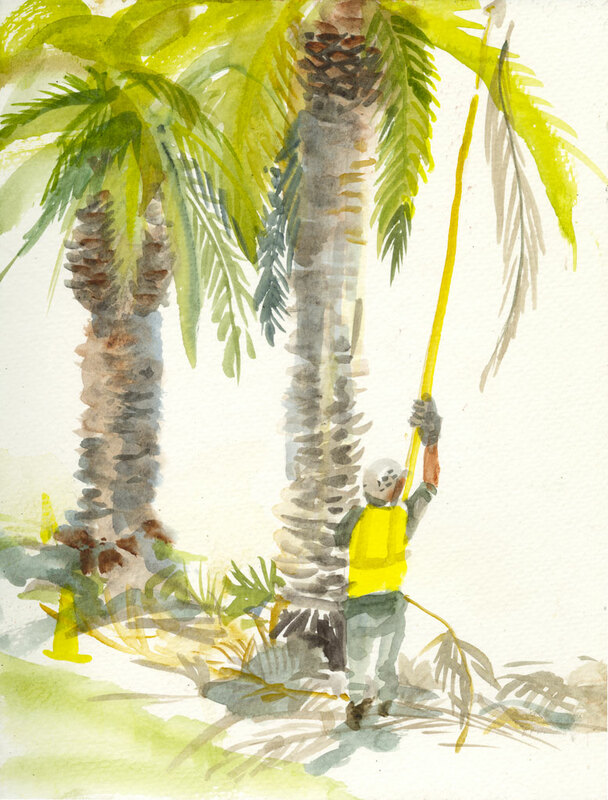 But as I picked up my brush I saw a falling palm frond out of the corner of my eye and realized that it would be much less intimidating to sketch the gardeners trimming the palm trees behind us while Gail made those shining bronze statues look like living things. I hope we get to do this again so I can look over her shoulder and sketch them in the same lively and graceful way.